The D-to-Z diamond color scale and the universal language of diamond color was created by the Gemological Institute of America in the 1950s. GIA created the GIA diamond color grading system to replace the descriptive terms that diamond dealers used to describe color. GIA knew that an objective standard for diamond grading, with defined steps between each color grade, would build trust in diamond value. 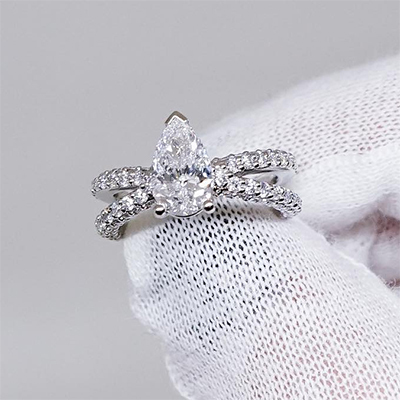 Completely colorless diamonds, what we now know as D color diamonds, were called “Jager diamonds” after a mining source that had produced very colorless gems. The legendary historical Golconda mine in India is also known for having produced completely colorless diamonds so “Golconda diamonds” are also a colorless. Why did GIA choose D as the best color grade rather than A or AAA or five star or some other superlative? GIA wanted to make sure that its scale wasn’t mistaken for individual dealer rating systems in use at the time. They knew that no one was crazy enough to use a D grade as a sales pitch for their diamonds so there was no danger that it would be mistaken for any other color grading system. Today, no matter what language you speak, you know that a D-color diamond is the best diamond color, as the GIA International Grading System has become the universal language of diamond quality. Before a diamond officially becomes a D-color diamond, it has to be graded by the GIA. Diamonds are graded face down so that the eye can focus on the body color of the gem without distraction from its brilliance and dispersion. But what does D color mean really? It means that a diamond appears colorless when placed upside down when viewed next to the D color diamond in the masterset. It’s much easier to see slight differences in color next to other diamonds so graders use comparison to judge color. In addition to their absence of color, many D color diamonds are chemically more pure than other diamonds, with fewer trace elements incorporated into the carbon of their atomic structure. Often D-color diamonds are type IIa, a rare category of diamonds that contain almost no nitrogen. Diamond type is a simple way of classifying diamonds based on their chemical composition and atomic structure. (Most diamonds used in jewelry are type Ia, which contain traces of nitrogen. These “cape” diamonds range from colorless to light yellow, since nitrogen absorbs blue wavelengths and imparts a yellow tint.) Type IIa diamonds are very rare, making them appeal to collectors. Will you be able to tell that your diamond has a D-color grade when you wear it? If your diamond is set in platinum or another white metal like palladium or a bright white gold, even diamond professionals will be able to see that your diamond is colorless but probably not its exact grade. The difference that D color makes in your diamond’s appearance is more subtle than the cut quality or carat weight of your diamond. D color diamonds are valuable because they are rare, not because they are noticeably more beautiful than other colorless diamonds. Is it worth it to buy a D-color diamond? Only you can say. Certainly D-color diamonds wouldn’t cost as much as they do if there weren’t people who were willing to pay a premium to buy them. If you are buying a D-color diamond, you are buying a rare investment-grade diamond and paying a significant premium for it. D-color diamonds, especially in large carat sizes, will sell for a multiple of other colorless diamonds simply because of rarity. If you do decide on a D color diamond, make sure that all other aspects of your diamond’s quality are also investment grade: the clarity should be VVS2 or higher, the cut should be exceptional (hearts and arrows or excellent), fluorescence should be none to faint, and your diamond should be set in platinum. Anything less and you are buying a diamond that’s good but not really exceptional. You would be paying a significant premium for a gem that isn’t the best. Why not buy a bigger gem that is just as beautiful without the pedigree? Bottom line? Don’t invest in D-color above other factors.